Overview - After a much-publicized departure from hosting NBC's Tonight Show, O'Brien hit the road with a 32-city music-and-comedy show to exercise his performing chops and exorcise a few demons. Filmmaker Rodman Flender's documentary, Conan O'Brien Can't Stop, is an intimate portrait of an artist trained in improvisation, captured at the most improvisational time of his career. It offers a window into the private writers room and rehearsal halls as O'Brien's "Legally Prohibited From Being Funny on Television Tour" is almost instantly assembled and mounted to an adoring fan base. At times angry, mostly hilarious, we see a comic who does not stop -- performing, singing, pushing his staff and himself. Did Conan O'Brien hit the road to give something back to his loyal fans, or did he travel across the continent, stopping at cities large and remote to fill a void within himself? Performers are strange people. Strange, sometimes broken, occasionally narcissistic, frequently attention craving, undeniably talented, and quite often brilliant people. There is just something inside them, something that fuels an unquenchable thirst for applause and a limitless desire to please. It's part noble, part self-serving, half gracious, and half egotistical, all forging a contradictory drum beat that lies at the center of every artists' heart, rhythmically and perpetually demanding them to satisfy and be satisfied -- though the latter always proves much more difficult. It is this clashing dichotomy of impulses and needs, that director Rodman Flender's documentary, 'Conan O'Brien Can't Stop,' focuses on. Through its intimate look at popular comedian, Conan O'Brien, Flender manages to capture a rare glimpse at some of the deeper machinations at work beneath the usually self-deprecating demeanor of the zany talk show host, as he survives a very difficult transitional period in his life through the only means he knows how -- performing. The majority of the documentary takes on a very intimate, fly-on-the-wall approach. Flender takes his camera through the entire process, following the conception of the show and the entire tour, including writers' meetings, rehearsals, backstage preparations, post-show tweaking, and the various, humorous, fun, raw, and sometimes even tense moments that happen in between the highs and lows of performing on the road. While there are indeed snippets of the actual show itself peppered throughout, this really isn't a concert film, and Flender's goals are much more ambitious. O'Brien himself becomes the focus, and his shaky internal journey and various interactions with his staff and fans, weave an interesting and often funny narrative on the addictive aspects of performance and the conflicting joys and pitfalls of fame and success. While the documentary's backstage look into the preparations that go into pulling off a touring musical comedy show are certainly interesting, the real draw here is the movie's examination of O'Brien. When we first meet the comedian, there is a certain frustrated sadness lurking beneath his amicable exterior. Though he doesn't hesitate to show his anger about the situation he's in, one gets the sense that he's hiding even more explosive emotions just beneath the surface, characteristically using humor to deflect pain. Throughout the entire process, we watch as O'Brien's demeanor changes and evolves. At first he seems to go through even more frustration and self loathing as the pressures of preparing the show grow, leading to some rare shots of the usually chipper host pensively staring off into the distance. Eventually as the tour continues on, he reaches a point where he can actually enjoy the ride and he suddenly comes alive again, reanimated like some red-headed, string-dancing Frankenstein monster of pure entertainment bliss charged up by the sounds of applause and laughter. Private moments in between the mad rush of shows are the most enlightening, and even when off the stage, O'Brien is almost always "on," wrapped in a constant ball of nervous and excited energy like a kid on a sugar high. His interactions with his staff are littered with humorous jabs, and while these comical exchanges are almost always good spirited, there is a frequent and revealing passive aggressive tinge to his jokes. This is most evident in O'Brien's relationship with his assistant, Sona Movsesian. Their bond actually forms one of the core aspects of the film, and though the host can be a little hard on her at times (always masking his irritation through humor), throughout the running time it becomes clear that they actually have a very close and even sweet friendship. Furthering the film's deeper themes, are O'Brien's interactions with his fans. Throughout the movie we see a love/hate relationship form between the two, as the host clearly wants nothing more than to please his admirers, but can't help but become frustrated when his inability to say no causes him to overextend himself. This leads to some rare instances of overt irritability as the comedian repeatedly puts himself in situations that he doesn't really want to be in, such as signing autographs after an exhausting show, entertaining famous friends before a performance, or introducing musical acts at a concert. Even though it's clear that part of him would prefer to just sit down and relax, the man just isn't capable of it, and his deep rooted addiction toward performing does inevitably take a toll. In fact, by the time the tour is over, O'Brien looks like he's lost several pounds and his skinny frame clearly shows the bodily affects of his physical and emotional labor. Though 'Conan O'Brien Can't Stop' can be very funny, what Flender actually ends up with is a rather insightful and at times even fascinating peek into the psyche of a talented, self-conscious performer during a very complicated and important period in his life. O'Brien's inability to stop (as the title so simply describes) is both admirable and perplexing, revealing a multifaceted and honest look at the man. Throughout the proceedings we see his addiction to performance cause him stress and anxiety, but even more so… joy. This is a man who loves what he does unconditionally. The whole tour actually ends up being much more than just a way to continue performing, it becomes his own healing process, enabling O'Brien to work through the trauma of losing 'The Tonight Show,' a gig he coveted for so long. With that said, the documentary avoids painting him as a victim and isn't really about the late night wars at all. Through the endless barrage of autographs, photo ops, rehearsals, nightly shows, and staff meetings, we get an intimate look at one man's unstoppable drive toward making people laugh. O'Brien isn't always shown in the most flattering light, but even when on edge he can't help put ultimately prove likeable, and dedicated Team Coco enthusiasts and detractors alike, should find this documentary to be both entertaining and enlightening. 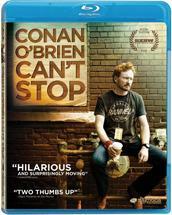 Magnolia brings 'Conan O'Brien Can't Stop' to Blu-ray on a BD-50 disc housed in a standard case. Some skippable trailers plays upon startup before transitioning to a motion menu. The packaging indicates that the release is region A compatible. The documentary is presented in a 1080p/AVC MPEG-4 transfer in the 1.78:1 aspect ratio. Shot digitally in high definition, the transfer is decent but has some issues that are most likely inherent to the comparatively low budget shooting equipment used. One of the most noticeable drawbacks to the image, is a sometimes excessive abundance of noise. While not horrible, it's pretty consistent throughout and can often give the image a rather low grade appearance. Other various artifacts are also visible periodically, including some combing in certain shots. While the majority of the content appears to have been shot on some form of HDCAM equipment, some sporadic archive footage also comes from other sources including a few upscaled standard definition shots. Detail can be good, but is inconsistent. Wide shots set during the actual concert tend to look the worst, and one particular sequence involving a strobe light effect causes the image to break up a bit. Colors can be nicely saturated in certain scenes, and conversely washed out or overcooked in others, all depending on various conditions. Black levels tend to fluctuate and can sometimes appear elevated, particularly during footage from the show. Contrast also waivers, looking blown out in some interview material, and fine in others. The inconsistent clarity, occasional artifacts, and pretty steady noise levels all seem to stem from the actual source elements and not the transfer itself. The resulting image can be nice but definitely shows its modest roots. The video effectively gives the proceedings a raw, intimate appearance that works well with the content and gets the job done, but offers little else, leading to a decidedly average yet perfectly functional presentation. The movie is provided with a DTS-HD Master Audio 5.1 track with optional English SDH and Spanish subtitles. Like the video, the audio demonstrates the film's modest source elements and features some inconsistencies. Dialogue is fairly clean throughout, but can sound muffled in certain scenes. Some unfortunate volume fluctuations also occur which can present the speech a bit too low. The presentation is fairly front heavy, but there is some directionality and surround use during some of the actual performance snippets. O'Brien's Harvard reunion show and gig with Jack White end up sounding the most robust, and offer some substantial separation, dynamic range, and bass activity. Unfortunately, a lot of the clips from other show performances lack the type of fidelity one might expect from such material. The reality is, this isn't meant to serve as a concert film, and the majority of the audio mix reflects the film's fly-on-the-wall, low budget approach. Some balance issues can be a mild annoyance, but like the video's shortcomings, all seem to be a result of the original recording methods and conditions. While there are a few standout sequences that actually feature some pleasing fidelity and surround use, this is a mostly basic but serviceable audio mix. Magnolia has put together a nice collection of very entertaining supplements including a commentary and some additional material. All of the special features are presented in 1080p with Dolby Digital 2.0 sound and no subtitle options. Commentary with Director Rodman Flender, Conan O'Brien, Andy Richter, Mike Sweeney, and Sona Movsesian - This is a very amusing and entertaining track and the participants all joke around together throughout while still throwing in some bits of useful information. O'Brien offers more candid and honest observations about himself and the whole shooting process, further elaborating on his passive aggressive behavior, potential addiction to performing, his attempts to occasionally hide from the director, and his compulsive habit of punching one of his writers (Sona theorizes that this is the result of sexual frustration between the two). While the various insights are nice, the commentary is actually very funny. Richter in particular gets in some great one-liners and one quip from Conan related to a certain hat that Andy wears still has me laughing. Fans of O'Brien should definitely give this a listen. Additional Scenes (HD, 42 min) - Ten additional scenes are included here and are viewable together or individually. The majority of the footage is centered on more humorous interactions between O'Brien and his assistant and writing staff. Some straight footage from the actual show is also included featuring some amusing bits from the host and standup from 'Conan' writer Deon Cole. Like the commentary, this material is actually funnier than what's included in the documentary. That's not meant as a jab at the doc though, as its goals extend beyond just humor, but these cut sequences are definitely very amusing and worth a look. Interview with Conan O'Brien (HD, 14 min) - This is a fairly recent (post Beardpocalypse) sit down interview O'Brien conducted for AT&T U-Verse. The comedian offers more insights into the impetus for the tour and more personal reflections on that very complicated period in his life, filled with the same zany and self-deprecating sense of humor that he's known for. Interview Outtakes (HD, 4 min) - This is some additional material from the previous interview that features some comical adlibbing and humorous flirtation from O'Brien toward his very attractive interviewer. 'Conan O'Brien Can't Stop' is an entertaining and sometimes fascinating peek into the famous comedian's insatiable desire to perform. With its honest, intimate approach we get a rare look into the deeper machinations that drive artists to do what they do. Video and audio quality are both basic but serviceable, and supplements are very amusing and insightful. This is a solid disc for a great documentary that definitely comes recommended.